There are two crowds converging on the O2 Academy in Liverpool, and they are very easily distinguishable. One is full of middle-aged parents and their sensibly-dressed offspring, here for the Christian rock band that is playing on one of the floors. The other crowd is a different matter altogether. Almost universally dressed in black, several with clownish face paint, it could only be one thing: A metal show. Avatar have spent the two years since they accidentally landed on the main stage at Bloodstock (to replace Graveyard whose flight was delayed) touring their arses off supporting acts such as Rob Zombie, Avenged Sevenfold, Five Finger Death Punch, and (in singer Johannes Eckerström’s own words, ‘stealing their fans’) amassing a respectable following around the world, and producing a new album, Feathers and Flesh, a concept album about an Owl who goes to war against the world (yes really!). But now, it’s time for a Euro tour as the headline act. To kick off the night we have fellow Swedes, The Last Band, who I initially discounted as the vocals weren’t to my taste, but by half-way through their set I was converted. Big beefy riffs, leather-clad lead singer with a shedload of charisma, what’s not to love? They did a great job warming the crowd up, and I for one will check them out the next time they are in the UK. And their new album, The Fall, is a corker! But we are all here for one reason – Avatar. The stage is surrounded by fabrics and lights to give a fitting carnival feel, and Avatar come out to raucous cries and a lot of devil horns. 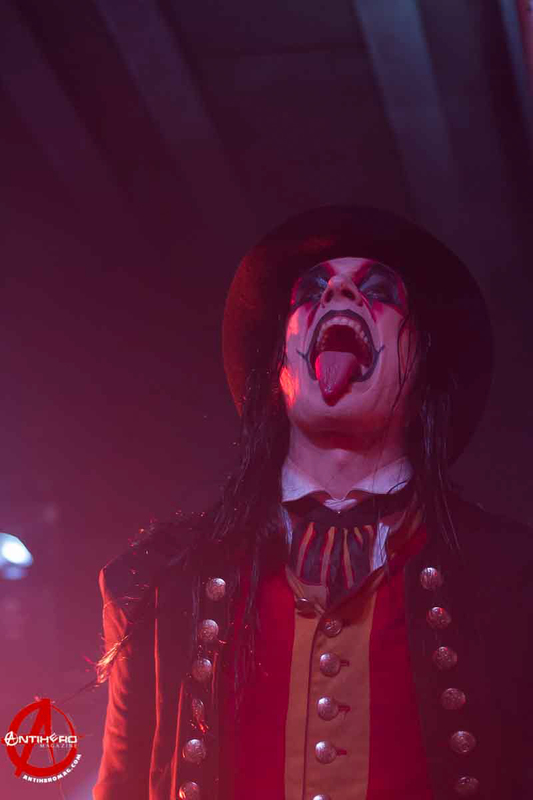 The band launch into “For the Swarm,” and lead singer Johannes appears in a cloud of smoke and frozen like a marionette on his ringmaster’s podium, bursting into life as the vocals kick in and marching round the stage like a demented member of the worlds darkest circus. “Hail the Apocalypse” swiftly follows, with “Torn Apart” and “Bloody Angel” following. Their set is a great mix of tracks from their last three albums, Black Waltz, Hail the Apocalypse, and the newest Feathers and Flesh, and not a single track from their earlier albums, which makes a lot of sense considering their look and their sound now has never been more appealing and well received. 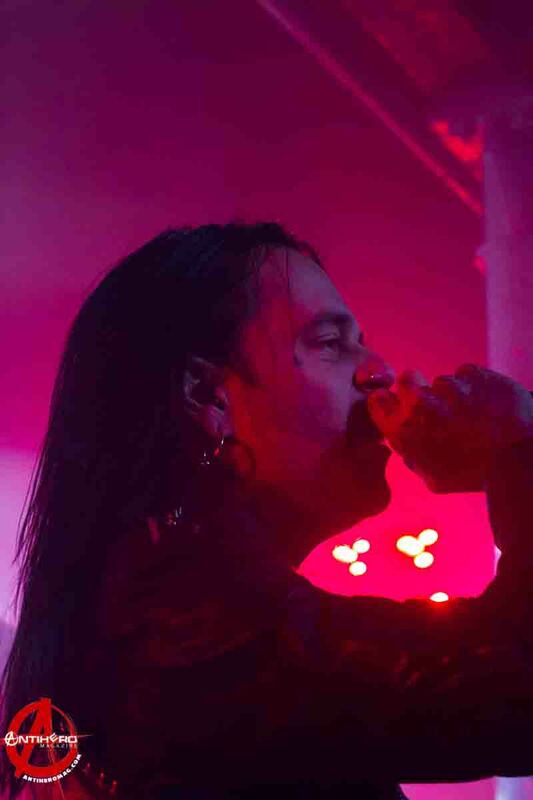 Johannes Eckerström, a ridiculously tall, immensely charismatic frontman, is like a man possessed, whipping the entire place into a frenzy of devil horns and sweaty moshing, interspersed with creepy monologues to the audience. “The Eagle has Landed,” “Paint Me Red,” “House of Eternal Hunt,” and “Black Waltz” are followed by drummer John Alfredsson’s obligatory drum solo, with the band then launching into “Vultures Fly,” which sends the crowd absolutely insane. “Murderer” follows and then “Fiddler’s Farewell” takes the energy down a notch, with Johannes donning a Pierrot clown costume and the slower tone of the song highlighting his more delicate vocal styles. It’s a lovely moment, well performed and eaten up by the crowd. The rest of the set is again, a mixture of old and new tracks; “New Land,” “Black Waters,” “When the Snow Lies Red,” “Let It Burn,” and “Smells Like a Freakshow,” before the entire band coerce the audience into a mass singalong to “Night Never Ending.” The encore was “Sky Burial,” which is my only criticism to an otherwise blinding show – a crowd wants to leave a gig on a high, and to end such an enthusiastic set on such a maudlin song left the audience ever so slightly disappointed. But aside from that minor complaint, it seems blatantly obvious that Avatar are made for bigger venues, and, judging by the crowd reaction tonight, that reality is only a matter of time.